Artificial Intelligence (AI) is not only a force behind the fourth Industrial Revolution but also a potential enabler of sustainable development in a wide variety of socioeconomic sectors. There has been explosive growth in research and applications in AI, particularly in the fields of machine learning, the Internet of Things (IoT), cloud and cognitive computing which are increasingly transforming the way we live and work in the region and beyond. Faster and versatile connectivity, together with exponential increase in the availability and type of data collected and analyzed in real time, provide us with unprecedented opportunities—and challenges—to social, economic and environmental development in Asia and the Pacific. These new technologies have been applied for accurate diagnosis in the medical filed, unparalleled data analytics in agriculture and insightful predictive capabilities on business and consumer preferences and trends, just to name a few. The emergence of robots, virtual assistants, automated factories and driverless cars has fast become a reality among the developed countries. In contrast, AI-enabled cyberattacks pose risks in undermining the integrity of electronic transactions in business and government functions which could causes significant losses and reputational damage. What do these technologies mean for Asia and the Pacific? Are we the leaders in Artificial Intelligence, as we are in some aspects of information and communications technology? Where and how would our member countries be affected by the emergence and expansion of this new force? How can we harness the powers but mitigate the negative consequences of AI? 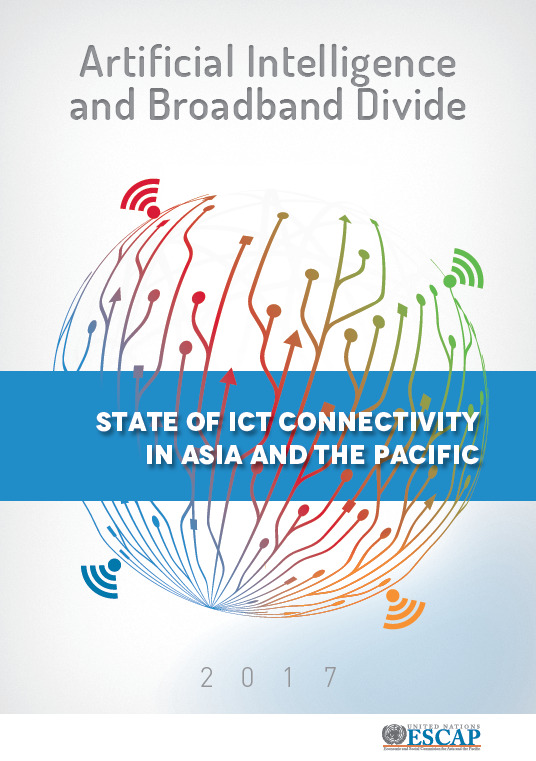 The report entitled “Artificial Intelligence and Broadband Divide: the State of ICT Connectivity in Asia and the Pacific 2017” by the Economic and Social Commission for Asia and the Pacific (ESCAP) aims to provide some pointers and kick start the regional discourse. This report analyses some of the conditions, prerequisites and drivers of AI development and uptake. The size of economy, technological absorption capacity and investment in ICT services have shown correlations with the quantity and quality of AI research, while the size of the telecommunications sector is found to be strongly associated with AI research development than other sectors. With the exceptions of US island territories, the most economically-advanced economies of the region such as Australia, Japan and the Republic of Korea unsurprisingly produced large numbers of AI-related patents, as well as a high number of patents relative to their population size. However, a disturbing but unsurprising fact is that broadband connectivity has a positive linear correlation with the quality of AI research, which demonstrates the importance of the underlying ICT infrastructure for the development and uptake of AI. At the heart of this emerging ICT landscape is the expectation that affordable and resilient broadband connectivity would provide ubiquitous access to connect people and devices. While least developed countries, landlocked developing countries and small island development states in Asia and the Pacific stand to benefit from these emerging technologies, the digital divide among countries continues to widen. The fixed broadband subscriptions per 100 inhabitants in the Asia-Pacific region is still far lower than Europe and North America, and remains below the world’s average of 12.4 in 2016. Advanced economies in the region have increased their subscriptions and the quality of their broadband networks, with the Republic of Korea having more than 40 fixed broadband subscriptions per 100 inhabitants. However, 18 ESCAP member countries continue to have less than 2 broadband subscriptions for the same indicator. Notwithstanding the dynamic development in mobile broadband, the Asia-Pacific region remains behind Latin America, Europe and North America, with respect to the subscription per 100 inhabitants. The widening gap among sub-regions in Asia and the Pacific is an alarming trend, considering that the widespread introduction of AI and related digital technologies is only possible with broadband infrastructure already in place. While developed countries, with the most expansive and high-speed broadband networks, are embracing and investing in AI at astonishing rates, developing countries are getting left behind. The development of seamless broadband connectivity has been a development priority in the region, but AI added urgency to it. Unless governments, academia, private sector and civil society make concerted efforts to address the aforementioned digital divide and bottlenecks in AI uptake this widening gap between countries would become unbridgeable. In order to address the challenge ESCAP member states in Asia and the Pacific initiated the Asia-Pacific Information Superhighway (AP-IS) to promote the availability, affordability, resilience and reliability of broadband networks from Turkey to Kiribati. The first session of the AP-IS Steering Committee is taking place in Dhaka, Bangladesh on 1-2 November 2017, co-hosted by the government of Bangladesh. To be attended by member countries, leading experts, partners and financial institutions, the meeting will pave the way for the region’s digital transformation, for faster and inclusive Information Superhighway which will enable countries to harness the power of AI for sustainable development.